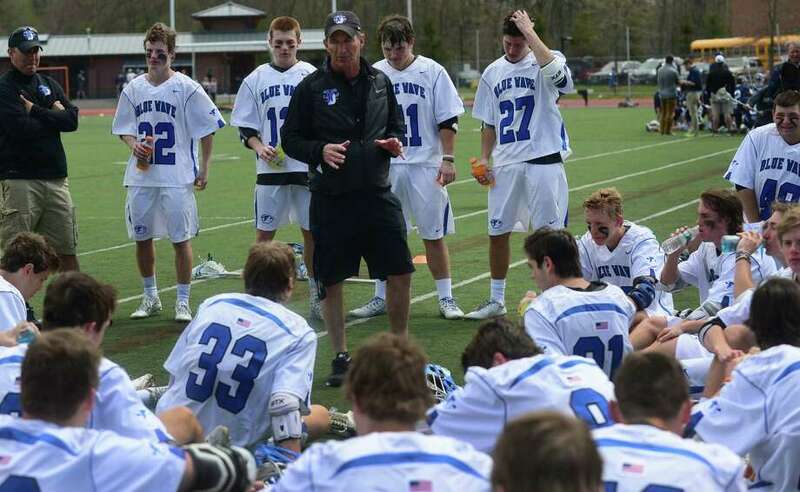 MARK EVANCHICK, DARIEN: Two-time Hearst Connecticut Media Boys Lacrosse MVP .... 2016 Hearst Connecticut Media Male Athlete of the Year ... Senior defenseman had 27 groundballs to help the Blue Wave win their third straight Class L and FCIAC championships … Selected to play for the North squad in the Under Armour North/South All-America game … Twice named Connecticut Player of the Year … MSG Varsity Tri-State Player of the Year … Three-time All-American, All-State and All-FCIAC first team … Will play at Penn. COLIN MINISCUS, DARIEN: Senior attack had team-best 119 points for the Blue Wave, who captured the Class L and FCIAC championships … Finished career with 150 goals and 130 assists … Set school record for most assists in a season (67) as a senior … Named MVP of the Class L title game … All-American, All-State, All-FCIAC first team … Will play at Amherst. JACK KNIFFIN, DARIEN: Senior attack had 93 points, including a team-high 70 goals, for the Class L and FCIAC champion Blue Wave … Finished career with 227 points, including 147 goals … Is tied for school record for most assists (seven) in a game … All-American, All-State, All-FCIAC first team, FCIAC Scholar Athlete … Will play at Brown. DARIAN COOK, BARLOW: Junior attack scored 53 goals and added 40 assists to lead the Falcons to the Class M and SWC Division I semifinals … Has three-year varsity totals of 108 goals and 60 assists in 108 games … All-State and All-SWC first team. PETER DEARTH, RIDGEFIELD: Senior midfielder helped the Tigers reach the Class L and FCIAC semifinals … All-American, All-FCIAC first team … Will play at Syracuse. KYLE SMITH, NEW CANAAN: Senior midfielder had a team-high 69 points (41 goals, 28 assists) for the Class M-champion Rams, who also reached the FCIAC title game … Selected to play for the North squad in the Under Armour North/South All-America game … Three-time All-State and All-FCIAC first team, two-time All-American … Will play at Denver. WILLIAM PERRY, GREENWICH: Senior attack finished with 52 goals and 31 assists for the Cardinals, who reached the Class L and FCIAC quarterfinals … Had career totals of 149 goals and 58 assists … Two-year starter … Selected to play for the North squad in the Under Armour North/South All-America game … All-American, two time All-State and All-FCIAC … Will play at North Carolina. CHASE LEVESQUE, RIDGEFIELD: Senior defenseman led the Tigers to the Class L and FCIAC semifinals … All-American, All-FCIAC first team … Will play at Boston University. CLAYTON BURT, NEW CANAAN: Senior attack had one goal and one assist in the Class M championship game to earn game MVP honors and help the Rams capture the title … Finished season with 26 goals and 39 assists for New Canaan, which also was runner-up in the FCIAC … All-State and All-FCIAC first team … Will attend Syracuse. DAVID STRUPP, NEW CANAAN: Senior defenseman helped the Rams claim the Class M championship and reach the FCIAC title game … Selected to play for the North squad in the Under Armour North/South All-America game … All-American, three-time All-State and All-FCIAC … Will play at Harvard. DREW MORRIS, NEW CANAAN: Junior goalie had a 5.3 goals against average for the Rams, who won the Class M championship and were runner-up in the FCIAC … All-American, All-State, All-FCIAC first team … Committed to Maryland. MICHAEL REALE, STAPLES: Senior midfielder finished season with 56 goals and 29 assists for the Wreckers, who reached the FCIAC semifinals and Class L quarterfinals … Holds school record for career points with 229 … Team captain … MSG Varsity All-Metro honorable mention, MSG Varsity All-Connecticut first team, All-State first team, All-FCIAC first team … Will attend Richmond. NICHOLAS FRANCHUCK, FAIRFIELD PREP: Senior defenseman led the Jesuits to the SCC championship and Class L semifinals … Team co-captain … All-American, All-SCC first team … Will attend the US Naval Academy. RYAN CORNELL, DARIEN: Junior goalie helped the Blue Wave win the Class L and FCIAC championships … Named MVP of the FCIAC championship game … All-American, two-time All-State and All-FCIAC. HUDSON HAMILL, DARIEN: Senior midfielder helped lead the Blue Wave to the Class L and FCIAC championships … Holds school record for most assists in a season (44) at his position … All-American, two-time All-State first team and All-FCIAC first team … Will play at Washington and Lee. RJ ROMEO, WILTON: Senior midfielder led the Warriors to the Class L and FCIAC quarterfinals … All-American, All-FCIAC first team … Will play at Providence. JEFF BRAMEIER, DARIEN: Coached the Blue Wave to their third consecutive Class L and FCIAC championships and a perfect 23-0 record.